BetTrader - What does the % represent? BetTrader – What does the % represent? BetTrader (Download and try for FREE) is one of the simplest Betfair (Signup and get £50 BONUS) trading software which I use on daily basis. When you switch to ladder view you will see % shown at the top of pink (lay) column & blue (back) column. What do these % represent? These % represent the share of total money available on both side at that point of time. 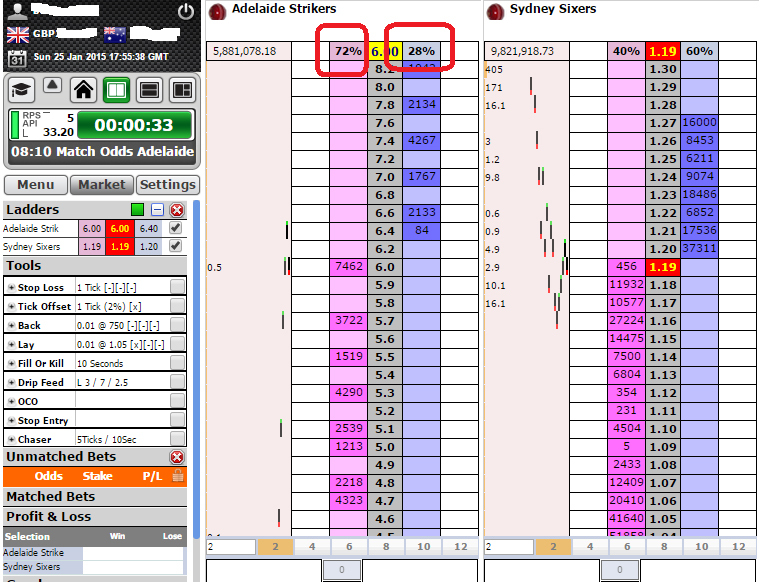 As you can see from the above snapshot taken from today’s Big Bash league match between Adelaide Strikers v Sydney Sixers 72% of total money is available on the lay (pink column) side for Adelaide Strikers and 28% is on the back (blue) column. What do these % tell us? If you see more money on one side then that side is active and punters are dumping money on that side which means that that side is favourite at the moment. From the example above you can tell that Adelaide Strikers are underdog (less favourite to win) and hence traders are laying (more money on pink side) this team. If you see almost equal amount on both columns then match is equally balanced. 1 tick (2%) (x) <—————— This percentage stand for what ?? " If sometime I back by using 5 tick (1%) it`s not put automatically other side for lay ". Mostly good but sometime only this kind of problem going on . Thx Munna bhai pls solve my problem & tell me how many % is mostly everyone using !!!! Munna bhai, mene 2 bar ap se contect kiya exclusive membership k liye bhai abitak koi reply nhi aya. Apka fan irfan ashraf. Today I am big winer. Neteller se dalo aur usi se nikalo. I am intrested to devloped android app for showing live bet rates,please suggest where i purchase api for showing live rates in our app. There is no such single API available for this purpose. You have to contact each bookie and get their live odds API.